Tostadas make a super delicious and healthy way to start the day! And they’re especially quick-n-easy to assemble when you use leftovers from your favorite home-cooked Mexican-themed dinner. That’s why whenever I schedule tacos or burritos on my Weekly Meal Plan, I also make sure there are some leftovers for making these fast and fun breakfast tostadas. Then, it’s as simple as toasting the tortillas, scrambling up some eggs, and pulling out a few leftovers to create an awesome build-your-own Breakfast Tostada Buffet. Place tortillas in 250-degree oven to allow them to slowly crisp-up (about 5-8 minutes). Heat a large skillet over medium heat. In a large bowl, whisk eggs with just a bit of water or milk, until foamy. Add some butter or olive oil to the hot pan and then carefully pour in the eggs. Using a whisk (or wooden spoon), gently stir eggs until curds form. Switch to a spatula to turn over eggs until cooked, but not dry. Transfer to a large bowl and cover. Place the scrambled eggs, tortillas and all of the remaining ingredients out on the counter to form a build-your-own Breakfast Tostada Buffet. Then, hand everyone a plate and take turns creating your own delicious tostada – definitely a fun and healthy way to start the day! Where is the recipe? I tried clicking on all of the highlighted words and they all come up as file not found? 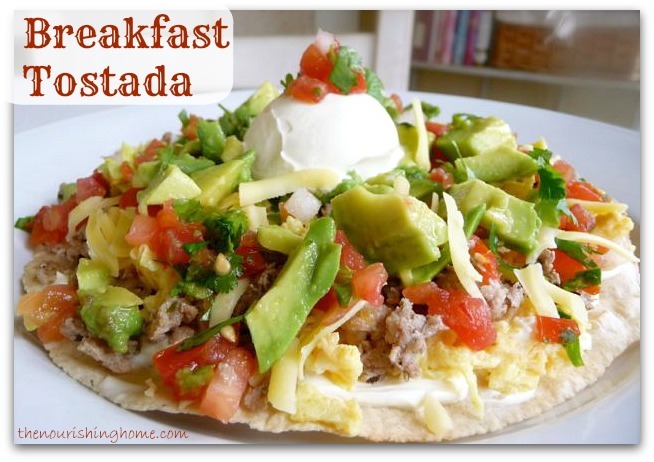 I never thought to make breakfast on a tostada. I make a lot of mexican food and this never came to mind. Next time I serve breakfast for dinner, it’s gonna look different 🙂 Thanks.